Nearly one in five ad executives acknowledge that ad agencies now take payments directly from their media suppliers to offset downward compensation pressure from clients, according to results of a survey of advertisers and agencies conducted by Advertiser Perceptions for MediaPost. 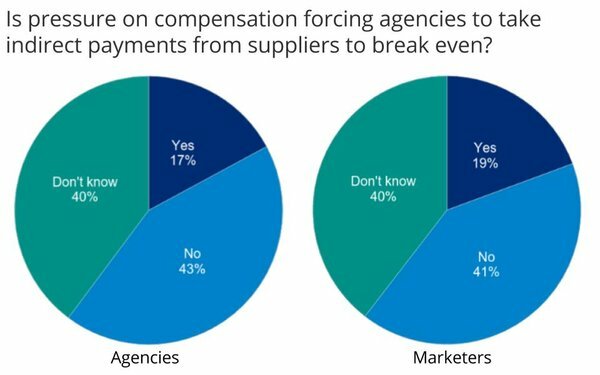 The study, which surveyed 310 executives online in June, found that 18% of respondents believe their agency takes direct compensation payments from media. 7 comments about "Only Two-Fifths Of Ad Execs Say Their Agencies Don't Take Kickbacks". Ed Papazian from Media Dynamics Inc, July 20, 2017 at 10:29 a.m.
Joe, another way of expressing the results of your study might be, "Of those agency respondents who claimed to know, 72% said that their shop did not accept kickbacks from the media". Joe Mandese from MediaPost, July 20, 2017 at 10:48 a.m.
That's right, Ed. That is another way of looking at it. Or you could say, 100% of those who said they knew their agencies were accepting kickbacks said their shop was accepting kickbacks. Not sure what your point is, but we were expressing the total findings. I think it's just as interesting that 42% of respondents don't know one way or the other too. Joe Weaver from Promatica, July 21, 2017 at 8:34 a.m.
Of course they take them! Ed Papazian from Media Dynamics Inc, July 21, 2017 at 10:25 a.m.
Just to be fair about this, how many "clients", who fork out large sums to "sponsor" big TV events like the "Super Bowl, World Series or the Olympics, accept---or count on----the seller's offer for an expenses paid junket to the location where the event is held---with their significant "other" as well as many fellow employees? Also, how many clients turn down invitations to lavish media seller galas, parties, yacht cruises, wine tastings, expensive dinners, cases of booze,free trips to Europe or the Bahamas, free tickets to one of their favorite pro team's crucial games with luxury accommodations, etc. on the grounds of impropriety? Aren't these a form of kickback? Shouldn't they, too, be banned? Joe Mandese from MediaPost, July 21, 2017 at 10:44 a.m.
@ Ed: I think that's a legitimate question. I think kickbacks are in the eye of the beholder and fall somewhere between prevailing industry practices, client agreements/contracts, and the law. Some years ago, I broke a story that then GE-owned NBC was sending 1099 forms to agencies and marketers that took their Olympics junkets, because they believed it was reportable income. Those forms of kickbacks are implicit. But when suppliers pay agencies a direct percentage based on volume purchased, that is an explicit form. It's actually a commission system. If those agenices don't disclose that to their clients, then I think that's a problem. Rick Greenberg from Kepler Group, July 21, 2017 at 11:22 a.m. Being an “agent” carries a very specific fiduciary duty to your client. Agencies: start living up to it. You deserve to know where your $ are going. This means understanding if your agency is accepting rebates or incentives -- but it also means auditing who is actually running your programs. When agencies outsource campaign management to performance networks, trading desks or platform managed service teams, that can mean another 15-40% bite out of the apple. In the end, that might well be worth it if the performance is there, but it only should be done with you knowing about it. It’s time for you to have your Network moment: "I'm as mad as hell, and I'm not going to take this anymore!" I recently gave a talk about the telltale signs your agency might not be operating with full transparency. Feel free to contact me if you want to know the key questions to ask. Ed Papazian from Media Dynamics Inc, July 21, 2017 at 12:11 p.m.
Joe, I agree about the agency giving the client full disclosure as a matter of principle. I do think, however, that if the media buying agency was obliged by the client to promise a particular CPM---or some other metric bearing on buying performance- and thus got the assignment, that the client should consider letting the agency share in the "savings", over and above its predetermined fee----if the CPM goal was attained and money was left over.This would apply, especially if it was the client who set the CPM goal. In this manner, the agency would have, in theory, an added incentive to do even better and it would be only fair to let it keep a percentage of the "savings" as an added fee. Obviously, this only works with full disclosure, not secretive kickbacks.